Current Projects What is next? Our dream of a human powered circumnavigation of the globe is accomplished. Along the way, Erden Eruç reached the highest mountain summit in Australia and Africa, Mt. Kosciuszko and Mt. Kilimanjaro, respectively by human power. He already had reached the summit of Mt. McKinley in North America in the same manner. Everest, Aconcagua and Elbrus remain to be climbed in Asia, South America and Europe, respectively. The summits were included in the Six Summits Expedition as a tribute to Göran Kropp. This project is the source of educational content and a co-fundraising program for Around-n-Over. Together with our education partners, age appropriate dispatches are disseminated to school children and funds are raised for specific projects which are executed during the journey. 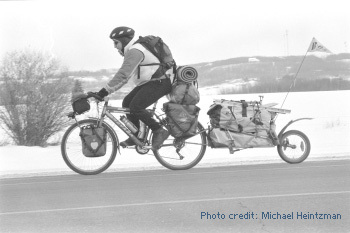 Erden Eruç had dreamed about a huge human-powered self-propelled journey since 1997. He was going to move his own body using his own power while tracing a path around the world. He had always wanted this journey to be shared with children around the world. His goal was to turn the world into a giant laboratory to inspire and to engage the students. Much research and efforts to define the route had already taken place. When Göran Kropp, who had encouraged him to take on the journey, fell to his death while rock climbing together in September 2002, Erden decided that it was time to make this dream a reality. He was inspired to add the mountain summits to honor Göran. The result was the Six Summits Project, Erden's quest to climb the highest summits on six different continents by human power. He would cross the oceans by rowing in a generally westward push to reach the next continent. From the point of landfall, he would travel to the highest peak on that continent by bicycle, where he would meet his friends for the climb. He would relay the journey and the experience to the students via the internet. The nonprofit 501(c)(3) charitable organization Around-n-Over will produce news and educational content about the journey as it unfolds, and will share its know-how for future human-powered challenges of similar nature. It will be a privilege for us to assist other dreamers with their journeys worthy of Göran's legacy. It is a mission of Around-n-Over to assist poor communities in their struggle towards self-sufficiency by providing basic educational aid and resources, know-how and facilities. We will accomplish our charitable mission in partnership with existing organizations on a case by case basis. Our research has identified İLKYAR Foundation in Turkey as a partner. With a quarter of a century of experience and passion behind it, İLKYAR helps elementary and middle school children in rural Turkey, especially trying to keep girls in school. Regional boarding schools where these rural students arrive for their basic education is their specialty. İLKYAR provides books, libraries, educational supplies, even clothing and shoes on occasion, and does this entirely with volunteer help. They utilize 100% of all contributions toward their mission, which is to promote among rural students the love of reading and the desire to stay in school. 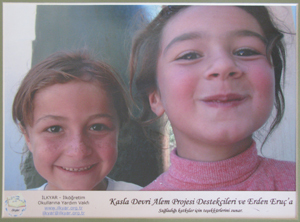 Often those who donate become volunteers themselves, ensuring an emotional investment in İLKYAR's projects. In keeping with our goal to have a positive impact on the communities which our human powered journeys touch, we decided to focus on the Mateves Secondary School near Mt. Kilimanjaro. In 2006, the Tanzanian government made secondary education one of its highest priorities, making it mandatory to have a secondary school in every ward across that country. Mateves Secondary school was established on 10 April 2006. The school is located near Mt. Kilimanjaro, 18 km west of Arusha town within Ngorbob Village, Mateves ward, Mukulat Division within the Arusha District Council. When established, there were 123 students and 8 teachers. The school had no classrooms so space had to be borrowed from a neighbor. Mateves is now receiving about 450 new students entering at the lowest secondary grade. Since 2006 the school has grown to approximately 1,200 students and will in the near future reach the government quota of over 1,600 students. The school has grown from no classrooms to ten all of which will be finished by September 2010. The school currently has 17 teachers. The school needs more classrooms. Even to get to the point of having only 50 students per classroom for proper student-teacher interaction, the number of classrooms would have to be tripled. 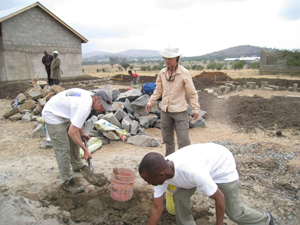 Donations are the main source of funding for new buildings. In partnership with Mountain Madness and African Environments, we will begin by raising funds to expand the number of classrooms in this school. Mateves Mission Statement is: "To tackle illiteracy in the community by ensuring that all enrolled students are provided with fitting and quality education, offered in an environment that is conducive, and delivered by a competent and highly motivated teaching staff." Our efforts will be worthwhile when we share the human powered journeys with the school children who will be inspired. Showing them the possibilities and presenting them with a window to a greater world is our goal. While the Six Summits Project is the first one, we intend to include the stories of other journeys here as well, all for education and inspiration. We will visit schools to meet the students both before and after the journeys to engage them, and to tap into their excitement. We will engage the classrooms from the ends of the world using any available technology, preferably a satellite phone to deliver voice and video clips, updates to the web site, and replies to e-mails. Participating educators will use supporting content surrounding each journey, making them each an effective teaching tool. Our goal will be to develop partnerships with other organizations which have an educational focus. We will continue to look for input from professionals in the field of education to add value to the human powered journeys which we endorse. 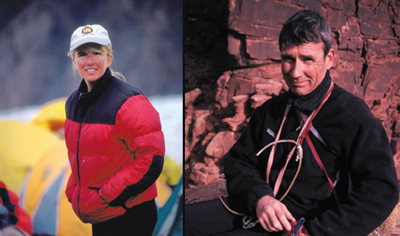 The general purpose of this fund was to defray costs related to the search and recovery effort for Christine Boskoff and Charlie Fowler whose lives and accomplishments embody the Around-n-Over mission of inspiring and instilling the values of selflessness, sacrifice and perseverance, and who died in a human powered expedition. Any surplus funds were designated to honor the legacy of Christine Boskoff and Charlie Fowler at the recommendation of Board of Directors of Mountain Madness, Inc. consistent with the 501(c)(3) tax exempt purpose of Around-n-Over. Christine Boskoff was the Owner & Director of Mountain Madness since 1997. Christine had led or taken part in twelve 8000-meter expeditions in Asia. She had summitted six of the world's highest peaks, actively guided, and explored. Christine was foremost a fellow climber, who listened intently and with great interest when we shared with her our Six Summits Project. Honoring the vision of Scott Fisher, founder of Mountain Madness lost on Everest in 1996, and under the leadership of Christine, Mountain Madness has continued to carry out socially responsible projects in mountain regions of the world where they travel. Charlie Fowler was a world-renowned alpinist, mountain guide, writer, and photographer. Charlie had 25 years of professional guiding experience and had started climbing in 1968. Charlie was a certified AMGA Rock guide and had worked as an examiner on AMGA alpine and rock exams. Charlie guided numerous expeditions to Patagonia and Asia, including far flung, unexplored regions of Tibet, Bhutan, and Nepal. Charlie made climbing both his livelihood and a lifelong avocation. The Boskoff Memorial Fund has since been established at Room to Read to honor the legacy of these two climbers. More information about this fund is on Our Score Card page. An Atlantic crossing was attempted with Tim Harvey of Vancouver to Moscow expedition. Tim Harvey began his journey in Vancouver with his former expedition partner Colin Angus in June 2004. Later Colin pressed ahead alone in Siberia and Tim reached Moscow after Colin by bicycle in August 2005. The project proposed to Harvey by Erden Eruç aimed to assist Harvey to return to Vancouver by human power. Harvey's alleged human powered journey to Moscow appeared to fit Göran's legacy; therefore, Around-n-Over decided to commit resources in order to help Harvey across the Atlantic Ocean. Erden Eruç landed in Lisbon to receive his ocean rowing boat ahead of Tim's arrival there by human power by bicycle. This Atlantic crossing was not part of the Six Summits Expedition. Six Summits Expedition will require another crossing of the Atlantic by Erden to bring that journey back to the Americas.